A sample of visual designs created for Autodesk's marketing campaigns, distributed across all digital channels including web, mobile, EDMs, and social media. Role: Visual design, art direction, and campaign messaging. I led the art direction and design of BIM 360 Team's product marketing pages, from concepting visual styles to wireframing the page layouts. 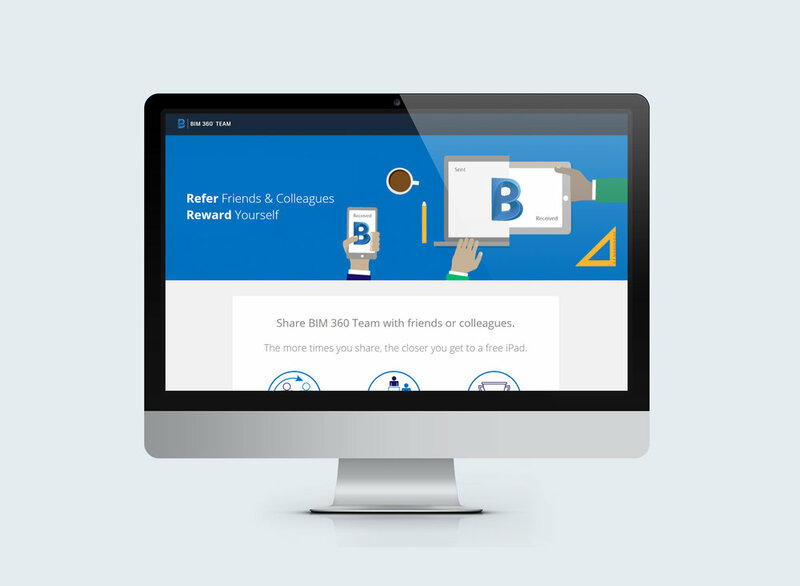 I designed the layout and custom illustrations for this BIM 360 Team Referral promo page, which was used for lead generation at Autodesk University 2016. The Autodesk A360 blog was suffering from an overuse of stock images that weren't resonating with readers. To increase readership, I created a series of stylized vector graphics to illustrate article themes and key product features. To promote the launch of the new "A360 Hangout" webinar series, I created this graphic to brand and showcase the "Hangout" webinar series. The graphic is used in email invites, social media channels, and paid ads to promote the series. Autodesk sends a number of nurture email campaigns to its users to drive engagement with their products. I designed a set of emails for the A360 design collaboration product, to make the onboarding process simple and easy for new users.